A cultural diversity diet is unlike other diets that generally provide lists of recommended foods or sets of recipes that are designed to meet human physiological requirements. These programs ignore human genetic differences and how our genes interact with the foods we eat. 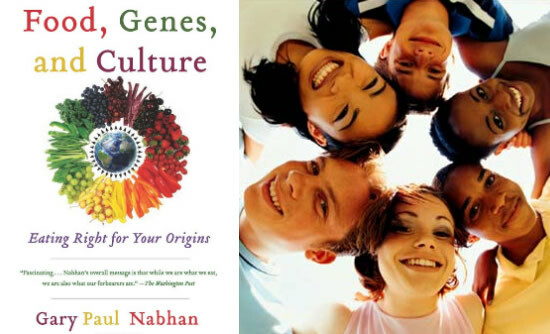 In Food, Genes and Culture, ethnobotanist Gary Nabhan discusses how our ancestral heritage can influence individual responses to food. He provides evidence how the perfect diet for one person may have catastrophic effects for another individual depending on ethnicity. Nabhan explains that the disconnection between traditional diets and genes has widespread and serious health implications. The dramatic increase in inflammatory diseases over the last fifty years is due to the loss of ancestral eating patterns. However, he asserts that general categorizations of ancestral eating – such as the Paleo diet – don’t consider dietary diversity between cultures. What our single common human ancestor ate is not the issue, he says. It is more important how much the diet of your ancestors deviated from these original food choices. This dietary variation and diversity is what has guided human evolution. As such food has the potential to dramatically influence the way your body functions through its influence on genetic expression. The composition of cultural diets varied widely between landscapes and seasons. This probably accounts for varying needs for micronutrients in different ethnic groups. In addition the composition of bioactive dietary chemicals was diverse. These chemicals are major driving forces for genetic expression, mutation, and selection and have a profound impact on our health. For example, wild plums contain up to 150 known secondary compounds – 67 of which been identified as being bioactive. Yet the composition of plums found in Bali, Hawaii and Africa vary greatly in their concentration of these compounds. If you consider the 30,000 edible plants on Earth then dietary diversity between populations would have been considerable. This cultural diversity diet traces food traditions around the world to reveal relationships between ethnicity and individual responses to food. Many of these developed in the first few thousand years after the adoption of agriculture. For example, those of Northern European descent may be able to obtain nutritional benefits by consuming dairy products. However, Native American individuals have a higher chance of displaying lactose intolerance. If your ancestors were from the Greek islands you will probably do well with a Mediterranean diet. In such people it leads to improvements in markers for cardiovascular disease. But in other ancestral groups a high consumption of olive oil may actually produce an increase in cholesterol levels. The difference in our ability to tolerate hot foods such as chile peppers is a common discerning element between ethnicities. To some degree this is influenced by genetics. Certain individuals are known as “supertasters” and they experience a greater burning sensation when they eat chile. Others are classified as “nontasters”. They are much less sensitive to chile and also hardly taste the bitterness of cruciferous vegetables. However, cultural contexts also have an influence and can shift our perception so that some enjoy the chile burn. Spicy food has an antimicrobial effect, which would have conferred a survival advantage for those living in hot climates. As such eating chiles has become incorporated into these cultures resulting in changes in eating behavior and food preferences. The cultural diversity diet: Food, Genes, and Culture: Eating Right for Your Origins retails at $19.99. Provides unique insights into how food, genes and culture interact to influence human health. Puts forward the idea that Paleo diets are too general and suggests an approach that considers different dietary heritages. May help individuals of certain ancestries to make healthier dietary choices. Does not offer a practical plan for selecting foods based on your ancestry. The examples of foods and different dietary patterns are limited. Much of the information is too specific to be of practical value in the overall design of a healthy diet. Some readers may find this cultural diversity diet overly scientific and difficult to absorb. The cultural diversity diet offers interesting and unique information about the interactions between food, genes and culture. It includes specific examples of the different ways food can affect health depending on a person’s genetic background. Unfortunately, the author does not provide readers with practical dietary advice that can be applied to daily life. Thus it will probably appeal more to those who are primarily interested in learning about the science of genetics and diet.